If most of you have kids like I do, you know that Goldfish crackers are a staple snack at most schools. Well I made some Homemade Goldfish Crackers. They are a cinch to make. Unlike the store bought version, my goldfish crackers are also gluten free and vegan! They have been kid and husband approved! 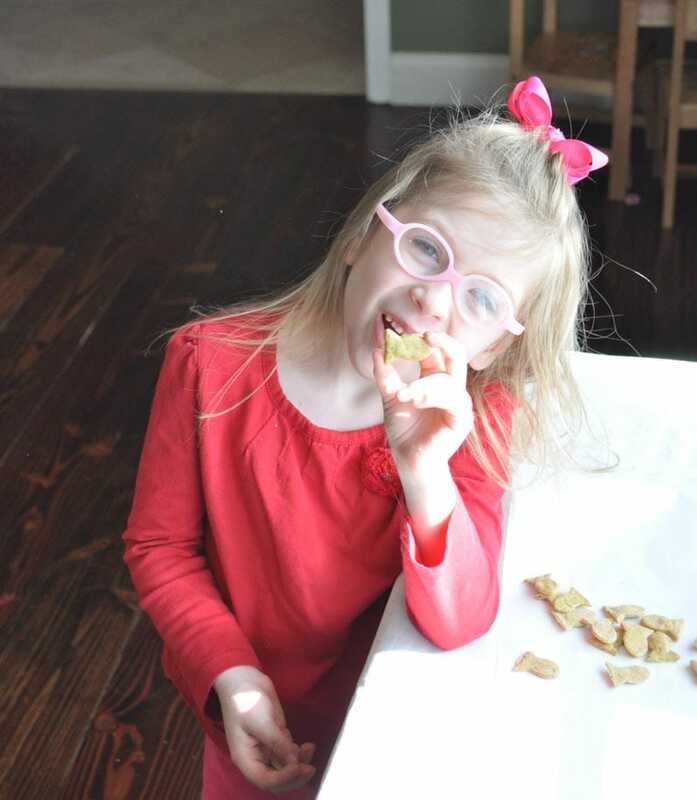 I wish I had made a double batch because my homemade goldfish crackers did not even last the day! If you like this, you may also like my Homemade Wheat Thins or my Homemade Cinnamon Toast Crunch. My 5 year old liked these so much, she kept trying to steal them as I was taking a picture for the blog. So I decided to take her pic and of course she modeled like a total ham! Love her! This recipe is super easy to make. I also think it’s open to different variations. Like maybe adding some herbs? Or some sun dried tomatoes might be good too. My recipe is adapted from this recipe. Homemade Goldfish with none of the additives. Made vegan and gluten free! In a food processor , combine all the dry ingredients and pulse a few times. Then add in the flax egg and coconut oil. The mixture will start to clump together. Add the water, one tablespoon at a time, until you get a dough consistency. Gather up the dough and place it on a floured surface. Using a rolling pin , roll out the dough until it is about 1/4 inch thick. I found it easy to place a piece of plastic wrap between the dough and the rolling pin to prevent the dough from sticking. 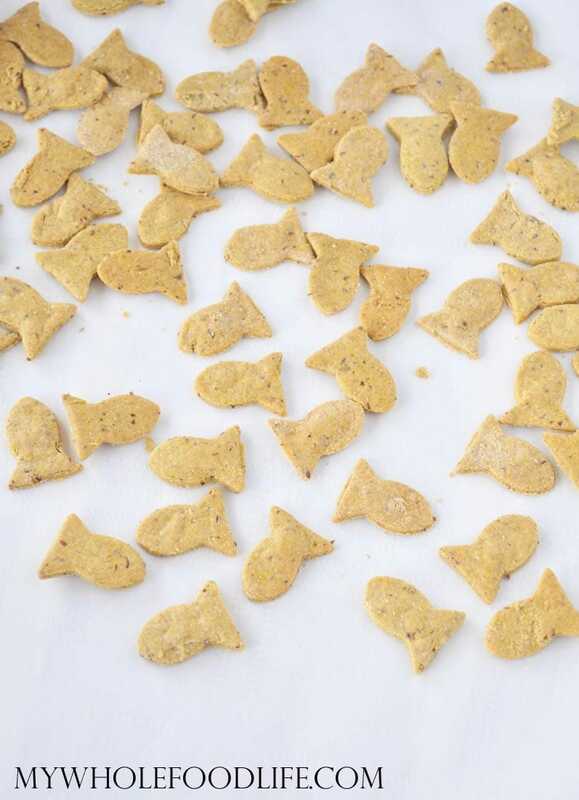 Cut into shapes using a goldfish cutter . Place the fish onto a lined baking sheet . Bake for about 15-20 minutes or until the fish are a slight golden color. Let the fish cool completely before storing in a glass jar. Enjoy! What a great idea for these!! Do you think a real egg would work instead of a flax egg? Thanks! I think real egg should work fine too. Awesome! Where did you get a tiny goldfish cutter? Thank you, love your blog! Thank you! I got it on Amazon. I linked to it in the post. I think you can also make your own. What is nutritional yeast? where do I find it? What can I substitute for coconut oil? Do they have any 'cheese' flavor? I need that flavor any idea on how to add that to the recipe? Thanks so much! The nutritional yeast adds a cheesy flavor while staying dairy free. If you eat dairy, you can use cheese in the recipe if you prefer. You can get the nutritional yeast at any health food store. You can also use another oil in place of coconut oil. Or even butter. I am not a goldfish fan, but my son was when he was younger. He can no longer have wheat or eggs so I thought I would try this for something different as a snack. After rolling the dough out, I just used a pizza cutter to make small rectangles. I liked these better than the original and they were really quick to throw together!! Thank you so much for posting all these wonderful recipes. I appreciate the work you have done to create recipes that take minimal time and use a few good ingredients. Yummy!! That is awesome! So glad you liked them Vicki! How long will these stay good for do you think? Hello, did you use whole oat flour? do you think ground rolled oats would work too? I'm so excited to try this recipe for my kids! They've missed goldfish since we went gluten/dairy free over 2 1/2 years ago. One question: what can I use in place of the coconut oil? My daughter is allergic to coconut (among other things!). Thanks! Thanks Erica! You can use another oil if you prefer. I hope you enjoy the recipe! These are super cute! Thanks for sharing! I loved those plain goldfish growing up and now that I'm vegan... those snacks are a no-go! Thank you! My husband is begging me to make more of these! Two for 2 now! I made the avocado chocolate chips cookies yesterday and these today. I've been making fishy crackers for a while now but with cheddar. I think I like these better! I used a smaller cutter so ended up with about 80 fish - between 3 kids, half are gone already. As a stay at home mom I've slowly been making the switch to homemade stuff - began with muffins and cookies, now it's everything I can do - and in the healthiest way. We are not intolerant of anything so wheat flours are used but I will also use coconut, almond and oat to change it up. My 6yr old wants to try cookie dough and apple cinnamon overnight oats so we'll be making those tonight. Can't wait! Yay!!! So glad you liked these too. My kids devour them whenever I make them. They don't last the day lol! Melissa, Do you think using chia instead of flax would work for the egg? My kiddos are allergic to flax! So glad you created this recipe! Is it possible to sub almond flour/meal for oat flour? I have a dumb question, but does 'T' in ingredient list means tablespoon? Just want to make sure before I try this out tomorrow.